Having trained in the WTF style many years ago, I always wanted to start training again, but never really had the gumption to do anything about it. We had a brief chat where you invited me to view one of your gradings. I immediately liked what I saw of how your students had respect for themselves and others. The technical aspect was also encouraging as so many other schools seem to dwell on the "fighting" side rather than the traditional/technical side. I have now been a student of yours for just over a year, and despite various health issues you have taught me to constantly push my boundaries both mentally and physically. I really enjoy training with you and the other students and I look forward to taking my 1st Degree Black Belt under your tutelage. Your selfless commitment to a students development is truly a rare thing in this day and age, but then helping others and yourself is what the ethics of Tae Kwon Do are all about!!!! 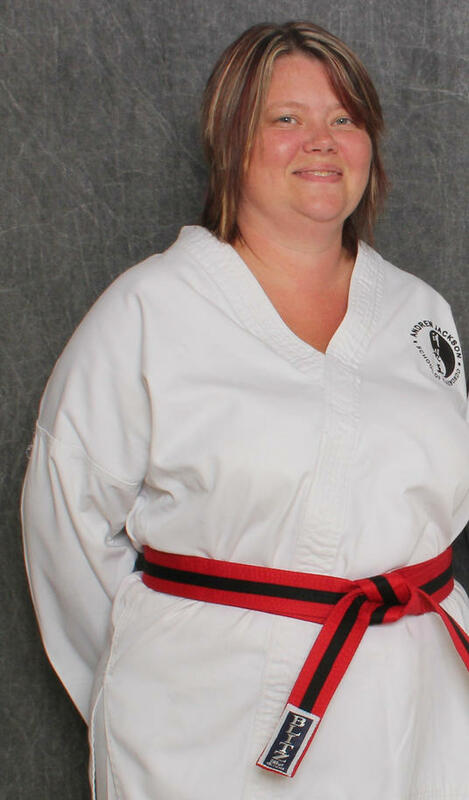 I haven't looked back since, I don't like exercise much and I'm not a slim lady, but I am now a red stripe and if everything goes well with the gradings (fingers crossed I pass them) then next year I will be going for my black belt. 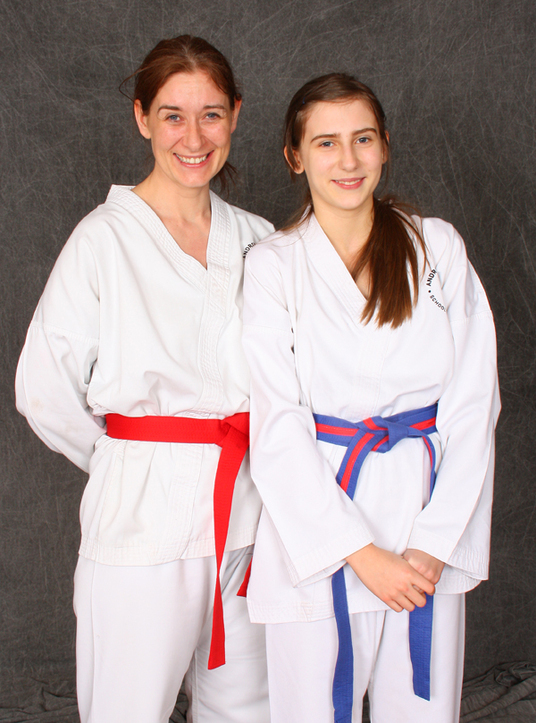 I never thought when I started that I would get this far, let alone the possibility of getting my black belt and considering my daughter got me started she decided it wasn't for her a couple of years ago, but I carried on because I do enjoy it. 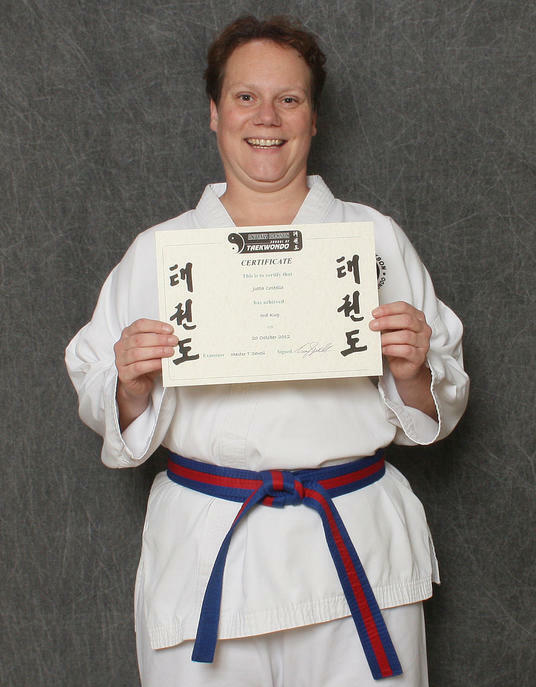 You have been a huge influence in my life, you started as my instructor, became my friend and now we are due to be married this year, so I know this may sound biased but I can assure you it isn't, I would never had got this far in any other Tae Kwon-Do school. You have also trained me as a personal trainer and knowing that exercise is not my thing you tailored the sessions so that I enjoyed them, which anyone that knows me well, would be really surprised at. You have also helped me when I needed sports massage a few times, I would say that I enjoyed it, but I didn't, because it hurt, but it did work and helped me recover sooner. We agreed to wait until she turned 10 & old enough to join the adult class. What I found in your classes have given me so much more than the common ground I wanted with Shannon that doesn't include nagging her to tidy her room & her homework! They levelled the playing field because we both started at the beginning together. It doesn't matter what you do outside the classes; your area in expertise becomes irrelevant because you leave it at the door. We just have to bring ourselves & a willingness to learn. The rest of the class are all so different from each other in age, size, fitness, personality we all have different strengths. You make the classes unpredictable except for the sense of achievement once it is finished. We were bamboozled by Korean; shuffling up & down the hall with our guard up it took me two weeks to learn how to turn around properly! I cannot believe how far we've come since then, we've both had very different journeys - very individual, I love that we are still taking that journey together both aiming for the same thing, alongside the rest of the class. The tenets of Tae Kwon Do echo my own sentiments of being a good person & as a parent the only way to demonstrate that is to action them. 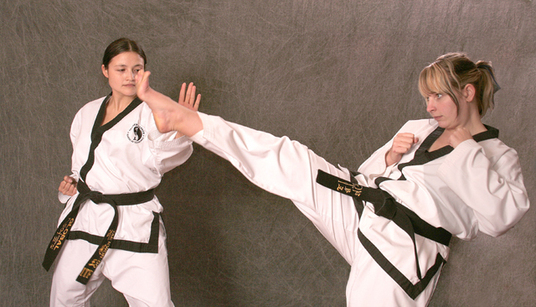 Tae Kwon Do has become a big part of our family life. My kitchen doubles up as a training space & Shannon enjoys telling me off for getting my theory wrong & helping me with the patterns. Anya & Joe, having witnessed this, wanted in & have joined the junior class under Caroline's instruction. They love it & are constantly jumping & kicking not realising they are honing skills that will put them in good stead when they take their grading. They are learning respect, discipline & confidence in themselves & for each other. My husband could potentially in time have four black belts under his roof which we all find very entertaining & he is very proud of us. Thank you for your unrelenting enthusiasm, energy & belief. I do not feel we could have achieved all we have so far with out it. We are very proud to be a part of your club, to have witnessed black belt gradings that have inspired us. The rest of the club are so supportive of each other - it's like a little community. You have become a close family friend & we look forward to the next four years & what that will bring. I went along in 2003 and Andy took me on. It was challenging I think for both me and Andy because I had learnt a different style of Taekwondo to the one which he taught. On top of this I was doing a lot of things wrong which Andy patiently and meticulously corrected- always explaining the reason why the way I was doing it wouldn't work and why I should do it another way. After 3 more years of training and learning I went for my 2 nd degree black belt and passed and this December I am going for my 3 rd degree. 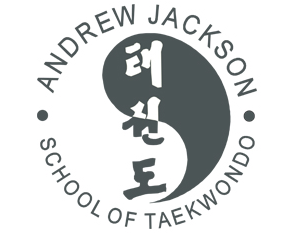 I really believe that any student can only be as good as the instructor who teaches them and I consider myself very lucky to have trained under Andy. Anyone who wants to learn Taekwondo should take the opportunity to learn under this man. Andy has also done some sports massage on my neck- On one occasion I had had to come home from work in pain hardly able to move my neck. I thought it might go away over night but when I woke the next morning and I still couldn't move I called Andy. After a 1 hour session with Andy I was able to move it enough to drive and go to work. It continued to free off for the rest of the day. I just wised I had called him sooner!! Now if I have the same problem I call him immediately as me not going to work = no pay!!! Mentally I was totally run down and hardly able to look after my family and myself when a good friend of mine told me that Andy was opening a lunchtime Tae Kwon-Do class. I decided to give it a go. I went along to the first session. After my first chat with Andy I felt at ease and all students in the club were very welcoming. I enjoyed the training and decided I'd want to stick to it. Over the next few months coming to the classes gave me an incentive to actually get up and do something with my life while the children were at school. As Andy has a very good knowledge of his students' circumstances he only pushed me as far as he thought I could cope with; if I had a bad day he took that into consideration. This caring way also came to show during the past eight months. Having had a bad back he could not only suggest other health professionals that could help me with my back problem, he also encouraged me to continue training at my own pace rather than sitting at home doing nothing. As I was able to increase the activities again Andy discouraged me from doing too much as not to damage my back any more, and if he considered I was doing too much he would "tell me off", or if there were occasions where one would have to do 20 press-ups I got away lightly. Two days ago I passed my grading and gained my blue tag. Although it was my own willpower that got me this far- I couldn't have done it without Andy and his passion for what he does. Inside the Dojang (training hall) Andy is my instructor to whom I have to show respect; but in everyday life this respect for him and what he does continues at the same level. 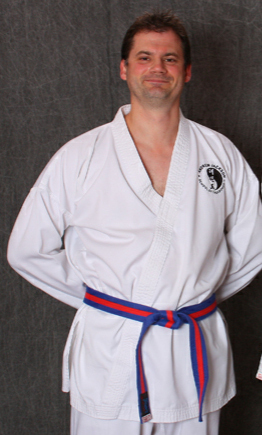 I would recommend Andy to anybody, whether it is for personal training, sports massage or Tae Kwon-Do. Thank you, Andy, for being who you are and for becoming such a wonderful friend. You work really well with all levels of students within the class and even when there are students with many different belts I still feel that you give individual attention to me to help me understand everything. Having attended your circuit training, I know that you are a great motivator but I now know you are a great teacher of Taekwondo too. He has progressed from complete beginner all the way through to black tag with Andy. He no longer gets bullied and the difference in Jordan is unbelievable.